Once upon a few years ago I was given two mid-70s Midas mixing desks that had been rescued from a slow death in a Wiltshire shed. They sat on the floor of my studio at the time (a roof space in an old malthouse in Bristol) and I would occasionally plug the bigger one in (a 36 module frame) and record various things through it for a different flavour. I became increasingly excited by the idea of restoring and modifying the desk to suit my own needs and whims as I found the raw sound very pleasing, especially the way it distorted – I have often turned it into a feedback synth as it produces rich oscillations. What particularly interested me was the potential for creating a studio centre-piece that would both inspire and limit my work so that a sonic character could be established and explored without investing the kind of session time that a large frame mixer can cost. The majority of the input channels are the PR003 type which have a simple three band EQ: fixed frequency high and low shelves and an inductor based mid-peaking EQ with three selectable frequencies (1.6kHz, 3kHz and 6kHz). There are two PR004s which offer more EQ options, but no sweepable parametrics. Each channels has two ‘foldback’ sends and two ‘echo’ sends and can be assigned to two of the four group busses…simple stuff. The Midas PR series was constructed to custom orders and made from the premium components of the day: Penny and Giles faders (wirewound! 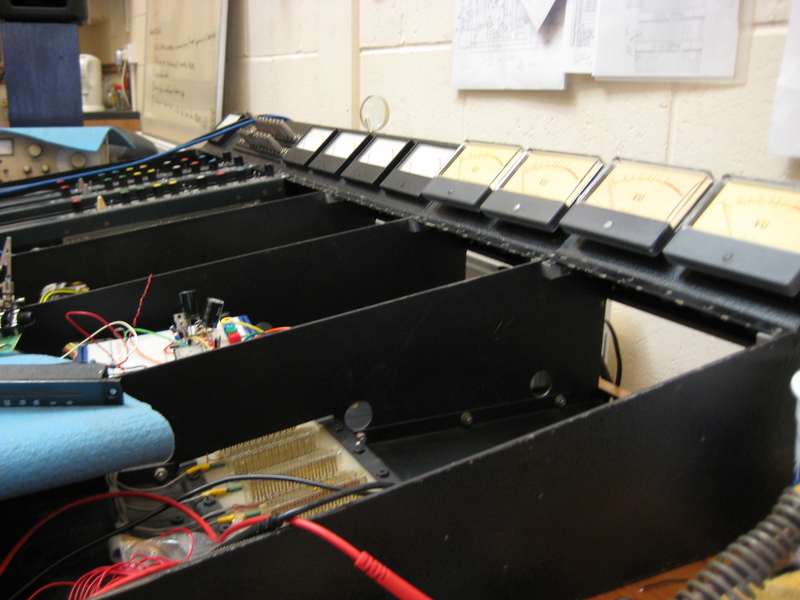 ), WIMA and Erie capacitors, Welwyn resistors, Sowter transformers, Plessey switches, Bourns pots and Ernest Turner VUs. The signal paths are short due to the simplicity of routing and EQ and the number of gain stages are few, which is all good news for audio quality. The only real negative aspect is the use of ICs for most of the gain stages, though the critical preamps and group summing amps are all discrete. In the mid to late 70s the quality of ICs was not what it is today and this Midas PR uses UA748s, which were superseded by the all-conquering NE5534 in the 80s and is still going strong today. The PR003 and PR004 input modules that make up 24 channels of the desk I am rebuilding use three ICs each for EQ buffering and final output (i.e. mostly unity gain roles) and are relatively innocuous in their effect. Nevertheless the UA748 is not neutral in tone and has some serious shortcomings. Having done a variety of qualitative tests I have decided to replace them all with On Semi NE5534ANGs, which significantly improves the frequency response and headroom. The aged electrolytic capacitors are being replaced and the final decoupling caps are being replaced with high quality poly film types, though I have yet to finalise the choice (there are a few listening tests to carry out yet). As well as IC upgrades and new caps there are plenty of crusty pots and crunchy faders to restore or replace, but there are some more fundamental changes to make. 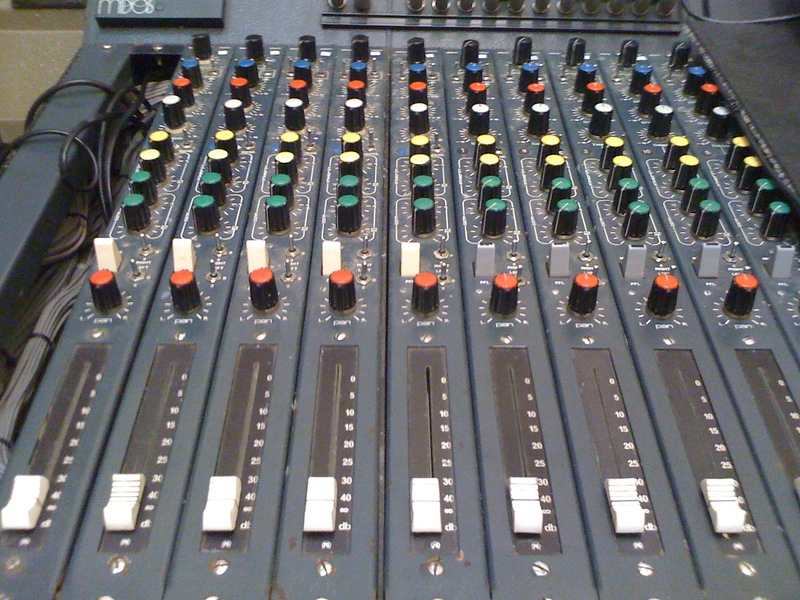 This desk only has four group busses, though there are eight group channels (four have no faders are were probably some form of monitor send), and there is no mix summing buss (i.e. master mix – these desks were mostly spec’ed for live use, most famously Pink Floyd’s Dark Side of the Moon tour). With some rearrangement of the main chassis bussing and by changing the channel routing switches I have managed to make it into an eight buss console with a stereo mix-buss (I managed to get a set of matching Penny and Giles faders to re-equip the four faderless group modules). Of course this means I have had to make my own mix and monitor section which is currently in breadboard form. The mix buss is based around two JFET discrete op amps (DOAs) made by Fred Forrsell (JFET992) and offers masses of clear headroom and output level. Tests so far show a healthy +23dBu output into 600Ω before clipping. Three of the nine VUs (8x group, 1x PFL) are damaged beyond repair and I have had no luck finding direct replacements (they are large Ernest Turners), but I happened to source four large Shinohara VUs that fit the chassis cutouts, and their different look gives the desk a wee bit more funk-junk factor! A selection of PR003 input channels. Less is more in knob world – just so long as they’re different colours. 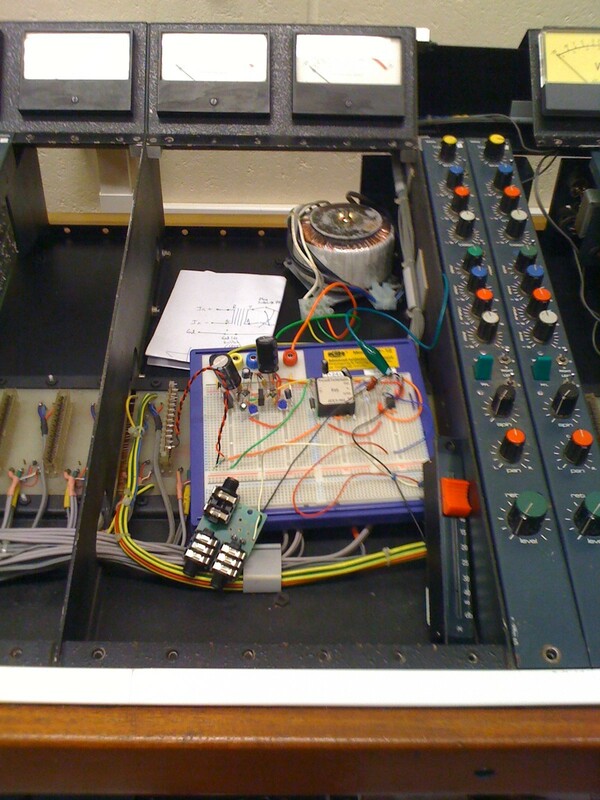 The JFET mix buss and PSU on a breadboard during testing (just one channel). Two foldback/echo modules to the right with their dub-tastic ‘Spin’ knobs which feed the return back into the send…oh yeah!